Acquired Book By: I am a regular tour hostess for blog tours via Cedar Fort whereupon I am thankful to have such a diverse amount of novels and non-fiction titles to choose amongst to host. I received a complimentary copy of “The Haunting of Springett Hall” direct from the publisher Sweetwater Books (imprint of Cedar Fort, Inc) in exchange for an honest review. I did not receive compensation for my opinions or thoughts shared herein. #HistoricalFix in October had a wicked good topic of discussion as it was centered around paranormal historical fiction, ghost stories and our genuine love of the cosier side of horror! I felt honoured I was able to attend this quarterly chat for a conversation which truly excited me beyond what words could express! In attendance were Katherine Howe, Cat Winters and Lynn Carthage (the latter of whom I interviewed when her debut novel Haunted was released!). Curiously, I ended up walking away with a copy of Haunted at the end of the evening, as the author appreciated the fact my favourite childhood toy was my Gloworm of whom was my reading companion as a child! During the conversation, as with previous #HistoricalFix’s the tweets are lightning quick, the chatter blissfully addictive, I started to notice that I am not the only one who is bemused by ghost stories! In fact, what did surprise me is how many of us appreciate the lighter side of the genre vs the horror-esque style of modern ghost stories! Not every contemporary author writes the horror into a ghost story, but imagine my jolly surprise in finding there were other writers and readers out there who liked the same versions I did! I happily mentioned The Haunting of Springett Hall and I believe I remembered to mention my readings of Edith Wharton’s Ghost Stories from Halloween 2014, as they became singularly memorable due to how Wharton wrote the ghosts inside her tales! I have been wanting to read more ghost stories and more PNR in particular, however, the hours slip past me in the hourglass, and another year has come and gone! Imagine!? I am hopeful by October 2016, I will have lots of lovelies to talk about inside this suspenseful genre as I do get a heap of happiness out of reading about ghosts! Mind you, I’m a bit more scared to admit The Barter is keeping my imagination on high alert as it’s a ghost story unlike any other I’ve attempted to read! This was a curious suggestion of a book to read for Halloween and I must say, I’m still working my way through it! It’s so chillingly haunting and quite fetchingly edgy, it’s remarkable how the author managed to keep the tone introspective as her character is trying to ‘think her way’ out of the horror of keeping company with a ghost! The beauty for me is finding stories like The Haunting of Springett Hall as I had a feeling even before I picked it up to read, this might become a seasonal favourite to re-visit due to how Wheeler pulled her story together and gave me such a wicked sweet read! Gentle spirits, innocent ghosts, expansive estates and the historical past – what is not to love about soaking inside this kind of a world where a girl realises she’s a ghost but forgets how that’s possible? Notation on the Cover Art: Quite happily, when I first soaked inside the first chapter, the image on the cover art started to percolate inside my mind’s eye as the young girl whose become the ghost of the hour is quite aptly described as the same ghost featured on the cover! So much so, you can almost feel her discomfort of wandering around an old Victorian estate home without so much as a clue as to why she’s there and what could possibly have caused this new ‘state’ of her life. Eighteen-year-old Lucy can't remember how she became a ghost, but the more she discovers about her past, the more she wants to forget. With the help of a servant named Philip, the only living person who can see her, Lucy must find a way to erase the mistakes of her former life before it's too late. This haunting romantic mystery takes you back in time to Victorian England. Filled with suspenseful scenes and thrilling twists - it's an impossible romance you won't be able to put down. E.B. Wheeler grew up in Georgia and California, where she became fascinated by stories of the places around her. She studied English and history at Brigham Young University and earned an MA and MLA from Utah State University. After several years teaching and writing about history, she decided to pursue her other dream of writing fiction. 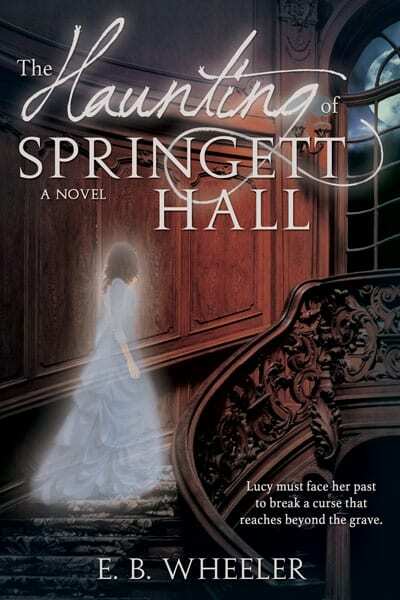 “The Haunting of Springett Hall” is her first novel. She currently lives in northern Utah with her husband, daughters, various pets, and a garden full of antique roses.